Unions claim they’ve been forced to shut down and pause work on an inner Sydney site because of asbestos exposure concerns. The Construction, Forestry, Mining and Energy Union (CFMEU) says work has been halted and 150 workers were told to evacuate the work site.Union state secretary Brian Parker says that documentation indicates that there have been several occasions where asbestos has been discovered on the site. According to Parker; no action has been taken by the project manager Bovis Lend Lease.Lend Lease spokesman David Hutton ensured that safety was the companies top concern.Hutton claims that small traces of historically buried asbestos have been uncovered throughout the last five years. 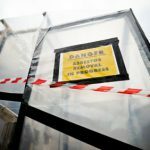 Hutton confirmed that the company has always closes and quarantines the site when asbestos is discovered in a small number of excavation locations. The asbestos is then allegedly removed in accordance with WorkCover regulations.